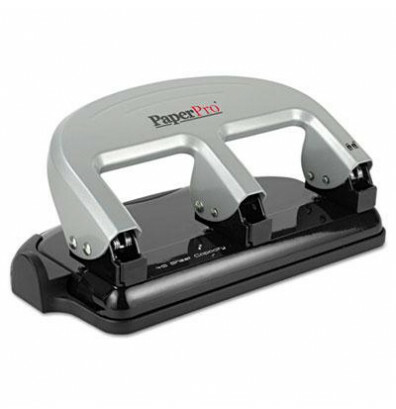 Three-hole punch cleanly and easily drills holes through up to 40 sheets of paper at a time with absolutely jam-free operation. Advanced dies make punching 50 percent easier than standard hole-punches. Handle locks down in place for efficient, space-saving storage. Internal waste chamber offers an easy-access rear door. Design also includes a jam-free mechanism, convenient paper guide and nonslip rubberized base.